Man of the match Josh Cobb described the Steelbacks as a ‘special side’ after they triumphed at NatWest T20 Blast finals day. Northants beat Nottinghamshire - their first win against the men from Trent Bridge in any format since 2006 - in the semi-final before slaying Durham Jets in the showpiece. 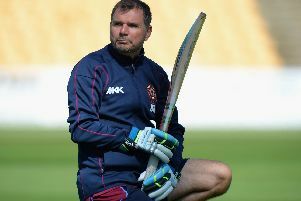 Both times the Steelbacks bounced back from the loss of three early wickets, with Ben Duckett delivering a fine 84 against Notts before Cobb cracked 80 against Durham. Alex Wakely was a mainstay in both innings, with the skipper helping to steady the ship. And the Steelbacks defied some late nerves to get over the line against Durham, winning by four wickets with five balls to spare to secure the T20 trophy for the second time in four years. “It’s a great day, one of the best in the calendar and to contribute in the final is very important,” Cobb said. “To win in the final is most important, but to contribute makes it even sweeter. “We were in a little bit of trouble and when Ben Duckett gets out for nothing these days, you know you’re in a tough situation. Cobb’s 80 from just 48 balls in a time of trouble was certainly a special innings. And he said: “From my point of view it was just one of those days where everything came out of the middle.